I know this is the April issue of the Journal, but even the April edition needs to have one serious article- here it is. EME is said to be the “Ultimate DX” by many. I suppose that’s because of the distance involved- about 500,000 miles from your QTH to that of the person you’re trying to work (plus the terrestrial distance of several thousand more miles, but that seems sort of insignificant after the big number, doesn’t it?). This article will (hopefully) cover most of the topics you’ll need to have an understanding, an interest, and maybe a beginning to get you on 1296 EME. EME was first successfully demonstrated in 1960 by a QSO between W1BU and W6HB on- you guessed it- 1296 MC/s (which is very nearly the same band as we now have- 1296 MHz). First, the Path Loss (Round-Trip) for a signal at 1296MHz between the Earth and the Moon is about 271dB (+/- 1dB for Apogee or Perigee, respectively). Part of that is due to the poor reflectivity of the moon, seven percent. The rest is just how much of the signal gets lost in the space between here and there and back again. Second, the Sky Temperature at 1296 is basically that of Cold Sky, or about Three Degrees Kelvin (3oK). This is a good thing, as it means that there is almost no additional noise out there to reduce the signal-to noise ratio of the already weak signal coming back from the Moon. Third, Circular Polarization is the standard at 1296 and above. This means that problems of Faraday Rotation and Spatial Polarization Offset (which exist on 144 and 432 MHz EME) are not problems at 1296. You don’t have to worry about being “Locked Out” by either of these phenomena. Fourth, 1296 appears to be the fastest growing EME band. Every month more stations appear on the band and are workable. This has to do with: 1) the superior noise figures of preamps that are now available at low cost, 2) the availability of (relatively) high transmit power, and 3) the ease of obtaining high antenna gain (10 and 12 foot TVRO dishes are being scrapped all the time and make wonderful 1296 EME antennas). Also, 1296 is an international allocation, so hams everywhere can operate, and there seem to be few problems anywhere with interference from other services or intermod from nearby commercial transmitters- it’s very quiet there! Fifth, one thing is for certain- you’ll need a receiver with an RIT of at least 3.5kHz (or a rig with dual VFO’s). The Doppler shift at 1296 can be as high as about 3kHz at the rising and setting moon and you have to be able to deal with it. First, you’re going to need some kind of 1296 all-mode radio. This can be a radio which does 1296 directly, like the new Kenwood TS-2000 ($$$), or a Yaesu FT-736 with a 1296 module installed, or a 1296 TRANSVERTER, down/up-converting from 144 or 28 MHz. The choice is yours and is somewhat subjective, based on the other gear in your shack and how big a budget you have for the project. Second, you’ll need as good a preamp as you can build or buy (the LNA, or Low-Noise Amplifier). Fortunately for those not into building microwave LNA’s, our friends at DEMI and SSB Electronics (among others) build and sell some pretty good ones. How good does it have to be? Well, ideally (pun intended) you want it to be ideal-that is, a noise figure of zero. Since that’s not possible, do the next best thing- get one that has the lowest noise figure you can find/afford. Frankly, it gets pretty tough to tell the difference between a preamp with 0.4dB noise figure and one with 0.25dB. Third, you’ll need an antenna. Maybe this should be first, but I guess I put the radio first since if you ain’t on the band, you can’t do EME. Anyway, a dish is the best answer. There are a few folks who have tried (with mixed success) yagi arrays on 23cm EME, but they are cumbersome, not very durable, and the phasing harness losses get horrendous as you try to add more and more antennas to increase the overall gain. It becomes an exercise in futility- the more antennas you add, the more phasing losses you have, and doubling the number of yagis (which should yield a net gain of close to 3dB) nets almost nothing- maybe 1 to 1.5dB because of the additional losses. 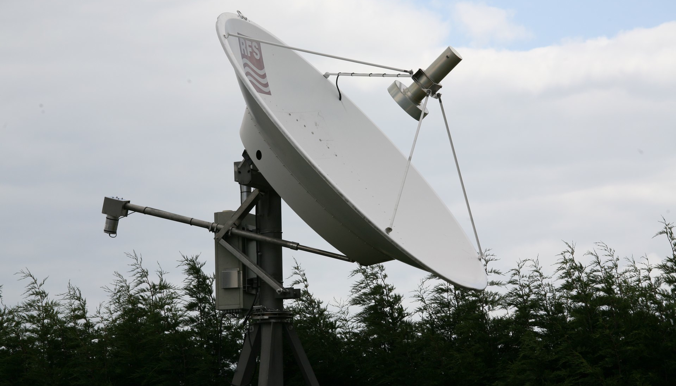 A small TVRO dish (10 or 12 foot diameter) will easily have the gain of 32 or 48 yagis, the advantage of robustness, simplicity of feed mechanism, and easily obtained CIRCULAR POLARIZATION (so no FaradaySpatial Offset problems, as already mentioned). Last, but certainly not least, you’ll need some kind of Transmit Power Amplifier (the HPA, or High- Power Amplifier). There is no substitute for high power-except if you don’t have it- then you run low power. Seriously, as with all the other aspects of EME, more is better (hmmmm… except for LNA noise figure. Now I’m getting myself confused! ), and certainly it seems that “better is more”, in terms of cost, anyway. To be completely fair, you should probably not attempt any serious EME with low transmit power. This is even truer at 1296. But just how much power do you need? I have worked stations that were running considerably less than 100W, and a 10 or 12 foot dish for an antenna. But it’s not easy, and it can be very frustrating for those small stations to be hearing others but unable to complete a QSO with them. So, I’d say the minimum you should plan to have as transmit power, at the feed of the dish, is 100W. This would give you an ERP (Effective Radiated Power), with a 10 foot dish, of 100kW. That’s pretty slim, but you can work a lot of people at that power level, and have a lot of fun. If your LNA is a good one, your dish feed is optimized, and you truly have 100W at the feed, you should even be able to hear your own echoes (with a good, narrow filter in the receiver). This means you could even expect to work someone else who is similarly equipped (a station equivalent to your own). Certainly, larger stations will be easier, as their antennas and transmitters are making up most of the differential in the link. In the “olden days” most 1296 EME operations were done via schedules. Schedules, while still used today by some small stations, are not really the norm any more. This is because there are so many “big guns” who can hear just about any station that gets on, that it just isn’t so necessary any more. However, for those who want to get their feet wet, skeds are a good way to go. They usually run one half hour, and it is predetermined which station will start (common practice is for the Western-most station to start, but this isn’t a hard and fast rule). Transmissions last 2-1/2 minutes. The standard T/M/O reporting system is used by small stations, but anybody who has made a few QSO’s quickly finds out that RST reports are the norm and a lot more fun! It also used to be true that the only significant activity on1296 EME was during the so-called “activity weekend”, when the moon is at high declination and close to Perigee. Again, that’s the way it was- nowadays, activity can be found anytime the moon is above the horizon. With a small station as previously described (10 foot dish, 100W at the feed, decent preamp), you can expect to work in the neighborhood of 40-50 stations. Some will come easily (K5JL, N2IQ, OE9XXI, HB9SV and others), and others will come only with persistence and probably some skedding at optimum times. But, one of the great things about EME is that even if there’s nobody to work, you can still test any improvements you make just by listening for your own echoes. You will know in 2.5 seconds whether you’ve made the system better or worse. I believe 1296 is the best band for EME. Newcomers can get on with a minimum of investment and have real fun. The final word: TRY IT- YOU’LL LIKE IT!